Cutting and caring for flowers correctly ensures that the hard work of your garden gets its best reception. Cutting flowers and caring for them is simple, but it helps to know what you’re going to do first. Here are our favorite steps to floral beauty and longevity — in the vase! Most flowers are best picked when they are just starting to show color, and will last longer at this stage than if collected in full bloom. However some flowers, such as dahlias and roses, may not fully open up if cut when the buds are tight. Generally, the best time to cut and collect flowers is in the morning when their stems are turgid and less likely to wilt. Ideally wait until the dew has dried because moisture on flowers in storage are prone to botrytis, a fungal disease that will ruin them. If you wait until the evening to cut flowers, do so when the sun is low in the sky and the air has cooled. In a perfect world, flowers would be cut only in temperatures below 80 degrees. Make sure your clippers are clean to prevent the spread of bacteria. A quick dip in a jar of alcohol in between harvests will also help reduce the spread of disease. Clippers should also be sharp in order to make a clean cut and not smash the stems. We recommend you invest in high quality clippers (pruners) and a sharpening stone. We like to use a strong pair of pruners for thick stems such as lilacs and other woody perennials. For thinner stems, we prefer these everyday garden scissors. Cutting flowers quickly and efficiently is a skill you develop with experience. You need to cut the flower, stripping the foliage from the lower part of the stem, and get the stems into water as soon as possible. Always be sure to use scrupulously clean buckets, or you’ll risk introducing bacteria that will quickly plug up the stems of your flowers and prevent them from taking up water. Without water, your flowers will quickly wilt. 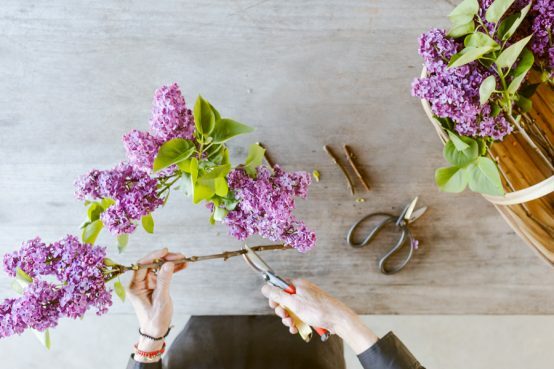 Once cut, it’s important to condition flowers to prolong their longevity and keep them looking their best. After cutting, you need to remove the field heat from the plant material as soon as possible to ensure the longest life. For the home gardener, bringing the flowers into a cool house or garage is usually all you need to cool them off. For best results, recut all stems using sharp pruners to avoid crushing the stems and reducing their ability to take up water through their stems. Leave the prepared stems in a cool place for 2 to 3 hours or longer to allow the flowers to drink up water and become turgid again. Some plants with weak stems and heavy heads are prone to bending. To help straighten the stems, wrap the bunch of flowers in newspaper and leave in water for at least two hours. As the stems take in water and stiffen, they will support the flower head in an upright position. This entry was posted in Grow Your Own and tagged floral, flower arranging, flowers, garden, how-to, slow flowers, tips.